Capsule wardrobes have been growing in popularity over the past few years along with the minimalism movement. 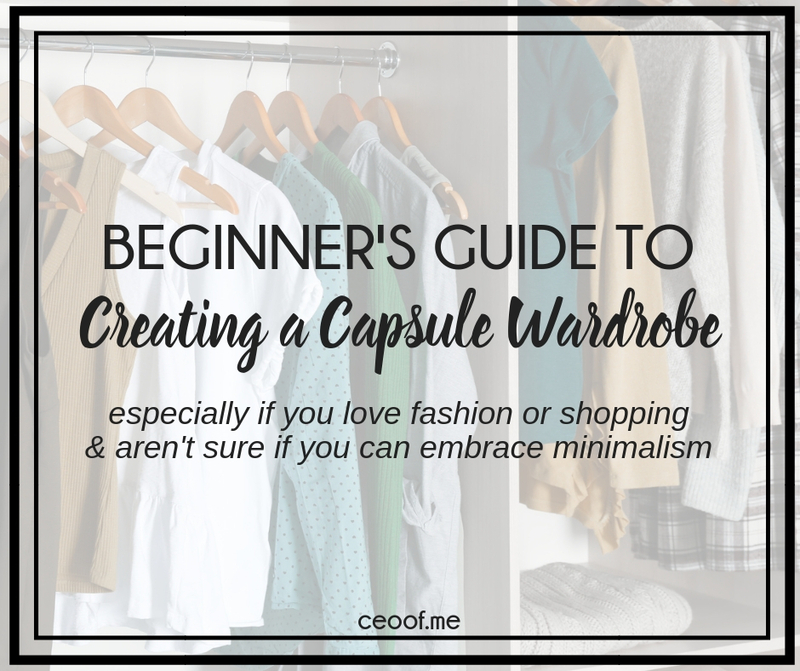 You might be wondering how to create a capsule wardrobe, especially if you really love clothes, are new to minimalism or don’t want to go to the extreme end of it. I never thought I would be someone who would implement a capsule wardrobe. I worked in retail for a lot of years and I love clothes and shopping. I think of myself now as a recovering shopaholic. I used to buy clothing to fill a void in my life, to make myself feel better & for the thrill of finding a bargain. A few years ago I began working to practice gratitude and an abundance mindset more & more. This led me to began feeling compelled to reduce the amount of clutter, excess & non-essential possessions in my life. I was embracing minimalism before I even know what that term meant. Minimalism is often misunderstood. It doesn’t mean you have to sell everything and live in a tiny house somewhere in the woods. It means being more conscious and aware of how you spend your money, what you surround yourself with and how you treat your possessions. It is a process of simplifying your life & increasing your abundance by decreasing your possessions. You might have noticed some very wealthy people who only wear the same color / style of clothing. Mark Zuckerberg, Jeff Bezos, Simon Cowell, Mark Cuban, Oprah Winfrey… Most of them say it is because it saves them time and makes life simpler. You may have heard the term but you aren’t sure what it really means. The term “capsule wardrobe” is credited to Susie Faux, the owner of a London boutique called “Wardrobe” in the 1970s. A capsule wardrobe is a collection of a few essential items of clothing that don’t go out of fashion, such as skirts, pants, and coats, which can then be augmented with seasonal pieces. In the 1980’s American designer Donna Karan released a capsule collection of seven interchangeable work-wear pieces. In the past decade, capsule wardrobes have become popular again. The main reason I got turned on to a capsule wardrobe began in 2016 when I was travelling all the time. I didn’t like having to carry a big suitcase or check my luggage & deal with the chance of lost luggage or waiting at the baggage claim forever at every airport. In order to travel with just a carry on suitcase and a small bag, I needed to have mix & match & layering pieces and keep it to 2 pairs of shoes (plus the pair I was wearing). Living out of a suitcase so often made me realize how easier it was to only have a few options for what to wear (and how much faster I got ready!) I actually really enjoyed not having so much STUFF to deal with every day. Whatever was in the hotel room or Airbnb I stayed at and in my suitcase was pretty much everything I needed. It felt so liberating and free that I wanted to have that type of feeling at home too. Half of my clothes had not fit me in more than 7+ years and I figured if I ever did lose that much weight again, my style had changed so much so that I wouldn’t ever wear them again. Also, even though I live somewhere and travel where there are a variety of seasons / weather conditions, really how many pieces of clothing was I actually wearing or going to be able to wear? Most of all, I wanted to live with more gratitude, simplify my life & be a better steward with my finances and possessions. I am SO glad I cleaned out my closet and simplified my clothes. There is a lot less clutter, my closet & drawers are organized, it’s easier for me to find what I want to wear & I only have clothes I LOVE to wear which makes me feel happier too. 👚Pull EVERYTHING out into a room or space where you can see it all and prepare to sort it. (This sight was shocking enough for me to want to reduce the amount I had after seeing it all piled up on my bed and bedroom floor, I couldn’t believe it). 👚 Separate by article of clothing. Make piles or get boxes & sort into stacks for tshirts, casual shirts, dress shirts, sweaters, pants, jeans, lounge ware, pajamas, skirts, dresses, underwear, leggings, etc. 👚Keep, Sell, Donate, Recycle, Trash: As you are deciding what to keep and not keep, put the not keeps into piles for sell, donate, recycle or trash. I personally didn’t put anything in the sell pile that I didn’t feel I could get less than $5-10 from because I didn’t feel it would be worth my time to take pics, post the items for sale and then ship or meet the buyer for $1-2 items. If you have a place to hold a garage sale or don’t mind taking the time to sell lower price items, then go for it! You could also bundle like 25 pieces for $50 together. I see a lot of people do that on FB buy/sell groups. My time is limited and donating items to someone who needs them makes me feel good too. I encourage you to donate to your local shelters so you know the clothes are going to people locally who really need them rather than to Goodwill. Remember to ask for a receipt as your donation may be tax deductible too! Trash is the last resort. Sadly, millions of pounds of clothing ends up in the landfills each year so try to help our planet & someone else in need out first. Only trash if it’s in such a condition that it can’t be fixed, re-used or recycled. 👚Separate by type of clothing: work, home, formal, church, lounge. 👚Separate even further by season / weather: summer = short sleeve, sleeveless, shorts, capris, etc. winter = long sleeve, sweaters, fleece, etc. 👚Separate even further by every day, out & about or special occasion. For instance if you mostly wear jeans or sweats & tshirts that’s every day… Then things you only wear once a week or weekends or if you go out would be out & about. Special occasion would be your more formal clothing. 👚Pick a color palette. Your capsule wardrobe doesn’t have to be boring or only black / white / solid colors. I try to keep everything in the same color palette & have a lot of mix & match pieces and things that can layer. (If you’ve seen me in videos / pictures you’ll notice I mostly only wear black, navy, blues, teal, greens & some purples.) Jewel tones & teal greens / blues are my personal favorite colors and my skin tone doesn’t look good in pastels anyways so I don’t even know why I used to buy those colors. I wear some florals and polka dots along with my solid colors. Pick colors & a pattern or 2 that you personally love or feel confident in. 👚Put it all back together nice & organized. In my closet I have dressy outfits & dresses then sweaters then dressy tops separated by long sleeve & short sleeved, then I have sleeveless tops, short sleeved tops, long sleeve tops & my zipper hoodie sweatshirts (I don’t wear pull over sweatshirts). I have separate drawers or spaces in my dresser for: jeans, capris & shorts, wear around the house clothes, pajamas, socks & underwear. 🧥Jackets & Coats. Again I paired down to solid / basic colors for my jackets & coats. I have a jean jacket, a lightweight tan & black mixed jacket that goes with most anything & a grey medium weight jacket plus 1 winter weather / water resistant coat and 1 dressy coat for more formal occasions. I hang these on the back of my closet door using a tiered / cascading hanger similar to this one. 🧣Belts & Scarves. I only have 2 belts, a black and a brown one and they are for necessity not fashion. Nothing against belts, just not my style. (I have big hips and most jeans require a belt as the waist is usually a little too big, lol). I do however love scarves and have about 12-14 of them. (Those also got pared down with my purge to basic colors / patterns that matched my chosen color palette.) I bought a scarf organizer and am able to get them all one 1. I hung it on the back of my closet door with my jackets for easy access. 👜Purses. Several years ago I stopped buying a lot of purses and decided to invest in just a couple basic color, good quality purses. (Kate Spade is my favorite brand for purses!). I now only have 4 purses: a tan crossbody, a black crossbody, a grey crossbody & a black regular size purse. I started with the crossbodys when I was travelling so much because they are smaller, allow me to be hands free & I don’t have to worry about someone stealing my purse/handbag as much if it’s around my body. Now I carry them 90% of the time too. 👠Shoes. I have paired down my shoes but I still have about 40 pairs of shoes including boots, sandals, flip-flops, flats, heels & sneakers. I did however reduce all my shoes into basic colors like brown, grey, black, navy for each category. (With the exception of a couple pair of flip-flops in teal & sneakers with greens/teal). 👗Think before you buy. Having everything sorted helps you know what you already own which can help you buy less items. You also need to learn to think before you buy (especially if you are recovering shopaholic like me) and ask yourself why you are buying that item, do you really need it or are you trying to fill a void for something else, shopping because you feel emotional, tempted by the bargain, comparing yourself to someone else or what someone else has/looks like/seems… Where else could you spend or invest that $ that could give you more long lasting joy? You don’t have to deprive yourself or never shop, simply become more self-aware of your shopping habits and reasons for buying. 👗Buy higher quality items in the future that will last you longer (or if you decide to toss it all and start from scratch!). Now when I buy new clothes I only buy from a few stores / brands that are higher quality and I know will last longer. You can also shop at consignment stores in higher end neighborhoods to find really good deals on brand name/higher quality clothing, often times brand new, tags still attached. 👗When you buy something new, get rid of something old. Having the limit of 100 velvet hangers helps with me with this because if I run out of hangers for my clothes, I make myself sell/donate older clothes/something I don’t wear so I can always keep it to 100 or less. I hope this helps you get started with simplifying your life or at least your wardrobe. 🙂 Remember it’s not about scarcity, depriving yourself or just getting organized. It’s about truly showing gratitude for all you have, being a good steward and creating a life that you love and surrounding yourself with more of the people & things that really matter. What about you? Have you adopted minimalism or a capsule wardrobe? What tips do you have to share or questions do you have? Comment below! Great article! I need to slim down my house too because it’s just too much “stuff”. I realized when we went on vacation that we really don’t need so many varieties of dishes, toys, clothes, etc. Now to find the time to purge it all. EEK!